Honolulu International Airport (HNL) on Oahu is Hawaii's major international airport for all foreign visitors. 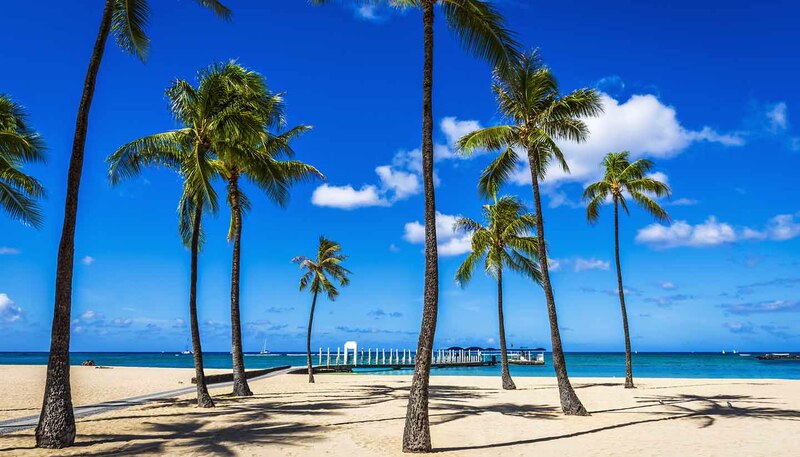 Cheap flights to Hawaii are available during the spring and autumn. Flights to Hawaii are served by a number of different airlines including Continental Airlines, Delta Airlines and Air Canada. The major airport is: Honolulu International Airport. Honolulu International Airport is situated 9.6km (6 miles) northwest of Honolulu's central business district. From London to Honolulu is 17 to 19 hours (including stopover, and depending on route taken). Hawaii: Hilo, Kawaihae. Kauai: Nawiliwili, Port Allen. Maui: Kahului. Molokai: Kaunakakai. Oahu: Honolulu, Kalaeloa Barber's Point, Kewalo Basin. Lanai: Kaumalapau. Several cruise lines run to Hawaii. Ferries run between Maui, Lanai and Molokai.